on Contractual basis for a period of eleven months, renewable for additional period. For details please visit www.echs.gov.in or contact No 01412249017. Last date of receipt of application is 25 May 2014. Working knowledge of computers and choice of minimum four polyclinics is mandatory (Polyclinics are Bhuwana, Chirawa, Dausa, Jhunjhunu, Neem Ka Thana, Sikar. Jaipur/ Vidhyadhar Nagar to be included in fourth choice only). C) Qualifications & Experience : As Prescribed by Dental Council of India as under. Professor a) A BDS degree of an Indian University or an equivalent qualification. b) Post-Graduate qualification / Diplomat of National Board in the subject. c) 5 years teaching experience as Reader. Reader a) A BDS degree of an Indian University or an equivalent qualification. b) Post-Graduate qualification / Diplomat of National Board in the subject. c) 4 years teaching experience as Lecturer. Lecturer a) A recognised MDS degree of an Indian University / Diplomat of National Board or an equivalent qualification. Application Fees – Rs. 500 (For GEN / OBC) in the form of IPO / Bank Draft drawn in favor of DDO,Central Jail Hospital,Tihar,New Delhi – 64. No charges for SC / ST candidates. 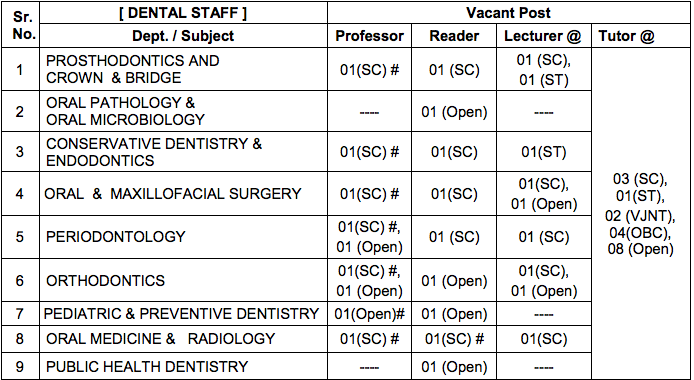 The Medical Superintendent, Safdarjang Hospital, New Delhi invites applications for the post of Junior Resident (non‐PG) in the department of Dental Surgery and Maxillofacial Surgery of this hospital. Eligibility: . BDS degree from a Recognized University. . Candidates must have completed their Internship on or after 01.07.2012. . Should be registered with DDC/State Dental Council. Pay Scale: Rs. 15600 + 5400 (Grade Pay) per month plus other allowances as admissible under the rules in central Govt. of India. Online Recruitment Applications (ORA) are invited from the desirous and eligible candidates for recruitment to various posts in various Departments of Himachal Pradesh Government up to 26th May, 2014 till 11:59 P.M.